1/2 cup nuts, your preference, soaked and dehydrated. See The Urban Poser for the ingredients/recipe. If you would rather purchase your marshmallows, here's a brand I prefer. Grease pie pan or spring form pan with butter. In separate bowl, whisk wet ingredients. Pour wet ingredients into dry ingredients. Mix. Oil your fingers and press the dough firmly to bottom of your pan. Bake 12 mins. Let cool completely. Shake coconut cream in the can to mix well before opening. Open the can and pour 1/4 cup of cream into a separate bowl. Pour the remaining cream into a sauce pan. Add gelatin to the 1/4 cup portion of coconut cream and stir together. Set aside. Bring coconut cream in sauce pan to light simmer. Sift cocoa powder into simmering pot. Stir. Add maple syrup into simmering pot. Stir. Bring mixture in pot to a light boil and remove from heat. Let cool for 5 mins and then add to your gelatin mixture. Pour into graham crust. Note: You can double this for more filling. However, don’t overdo the maple syrup. You want this S’mores layer to be more bitter chocolate because the marshmallows/crunch layer is sweeter. After the pie is completely cool, add a thin layer of nut butter. Using a blender/Nutribullet, rough chop nuts and chocolate chips. Do NOT blend too long…it will turn into nut butter! Sprinkle on top of nut butter spread. Follow the instructions/recipe listed on The Urban Poser to make homemade marshmallows. Then, move oven rack to the second highest and turn oven setting to Broil. Sprinkle prepared marshmallows on top of pie. Place the pie in the oven and check every minute to make sure not to burn the marshmallows! I also flipped the marshmallows to toast both sides. Note: The heat from above will melt the nut butter and chocolate. 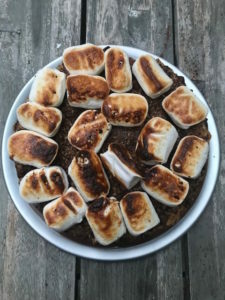 So, if you want a more “put together” or chilled pie, roast the marshmallows separately and then place on top.